Danielle Jeffers speaks to a freshman year management class for the Entrepreneur track overseen by Sean Collins, Director, Apex Center for Entrepreneurs. Danville Virginia native Danielle Jeffers’ journey as an entrepreneur began as many others do—with a personal experience that opens one’s eyes to identify a need that can be filled or solved with a business idea. Jeffers experienced just that and the soon to be VA Tech graduate is now a young business owner who travels to speak in local communities. That commitment and subsequent hard work led her to qualify for enrollment in the area governor’s school program and she took many dual enrollment classes at her local community college, earning college credits that would prove to be crucial. Jeffers says that her world was upended again when her parents “sat me down my senior year and told me they couldn’t afford to send me to college but of course I still had to go. That was a tough conversation that I wish we had had earlier.” Her parents had both suffered health issues for a few years which had impacted the family’s income, but Jeffers was not prepared for this reality so close to the end of high school. 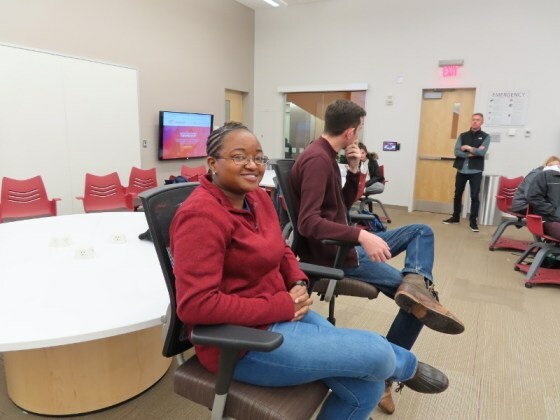 While she didn’t win, she received a lot of feedback through the process and by the second semester of her freshman year, in January 2016, Jeffers founded “Dough 4 Degrees” (www.dough4degrees.com), a scholarship coaching company which teaches through independent resources like eBooks. Jeffers has since been able to raise over $75,000 for Dough 4 Degrees. “Apex Center for Entrepreneurs is a core reason why I’ve been able to run my business and stay in school, a high priority I never lost sight of. I was able to bounce ideas off them, and learned a lot about time management. I continually leverage my experience with Apex to talk to others, begin a conversation and make a connection. I have met people from all over the world. I always try to figure out how to stand out amongst the crowd,” said Jeffers. Jeffers has deepened her experience through a leadership position she holds in VT’s “Innovate,” a residential program offered through Apex that offers residents additional support and access to guest speakers, advisory boards and the support of fellow like-minded students, a responsibility Jeffers takes seriously. She stresses the misconception that only certain people can benefit: “There is a lot of money available for people from every background.” Dough 4 Degrees is more than a side project, it’s a lifestyle. Visit https://www.apex.vt.edu/about/ for more information. See the article where it originally ran in the Roanoke Star.